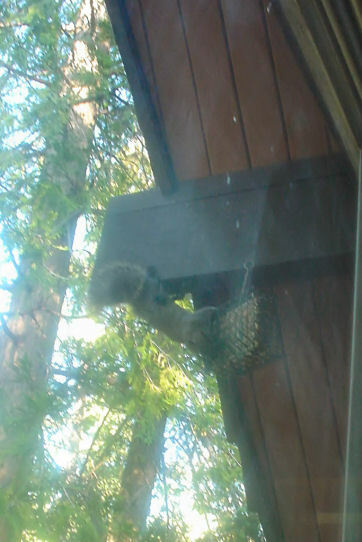 Squirrels like bird seed. If the woodpecker feeder is out, then it just means a little more work to go under the beam, and see what can be done about that pesky cage. 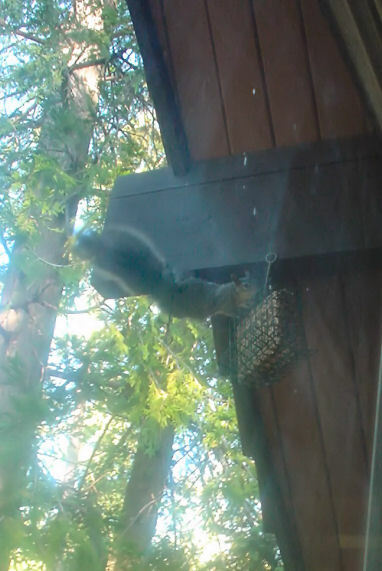 Fortunately I’ve caught one at it before, so this time I made a bit of noise so I wouldn’t have to walk around the house and pick up the bird feeder off the ground. 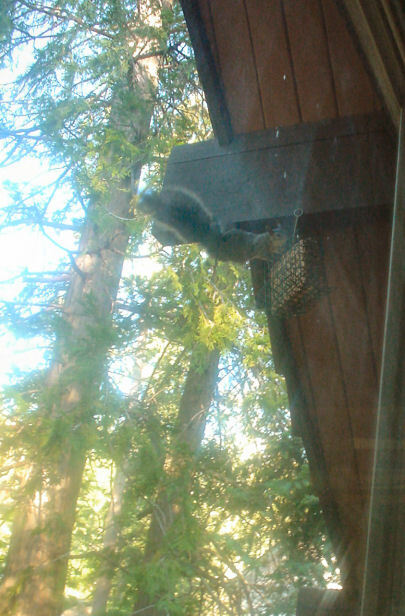 I also put out some more squirrel food, this with corn and sunflower seeds. Though the squirrel seemed to disdain the corn. I think I’ve given her a sweet tooth. I read with interest that Rove looks to be grooming Giuliani as Vice President. Now, my suspicions are that Bush and Rove have been also actively working to give Condoleeza Rice an increased national stage and wider experience. She recently worked with the City of New York to help push that city’s 2012 Olympic hopes. “Rice/Giuliani 2008”? I wouldn’t be surprised, and I would guess this is a guaranteed win ticket. Domestic affairs are, arguably, Dr. Rice’s weakness, and Rudy would be able to step in with his New York experience. I think we would all like that. This ticket would also likely mean that Republican’s would hold the White House until at least 2024, once Giuliani does his eight years after Rice. Which would then put us in line for George P. Bush. I suspect Rove sees this, and is not just plotting the next election… but the death of the Democratic party in its present form, forcing the rise of a new second party by 2032. I think we would all like that as well. Uncategorized Comments Off on Commandments? One thing beyond dispute is that when courts are involved there is not unity. The muddle of the Court this past week created less guidance on the matter of how the Ten Commandments should be displayed which in turn gives folks filled with all manner of muddle to spread their particular frenzy to all sorts of places. Make no mistake about it. This is not an issue about lying, or stealing, or killing. This is an issue about control, pure and simple. It is about power, it is about asserting one over the other. Not on one side of the debate, but both. No one would care about putting monuments like this around if folks weren’t so giddy about taking them out. It’s a brutal cycle of protest, where frenzied souls rise to the defense of their supposed cause, patting each other on the back for doing “good work” and being merrily led to the pit. There is nothing Christian about erecting monuments to the Ten Commandments. It is an act of public piety, meant to express the power of the preachers involved, meant to highlight their religious fervor and in doing so weaken the real paths of Truth in this world. Post the commandments on your heart, or hand, or forehead. Don’t insist they stand where they will be, by nature, taken in vain. These folks are using the Name of God for their own assertions of power, insisting his Name and Law is watered down for some Civic symbol, treating holy words as tools for their own distractions. On the other side are those who are so easily offended they cannot bear to see anything which breaks through their glass shell. They insist the Law of the Land protect their sensibilities, which are apparently so shallow and weak as to not merit any form of protection. They cannot bear religion in their heart and so cannot bear it anywhere, the frenzy of their souls strike out against any thought which would disturb their superficial ego, and cry out with pain at the slightest touch upon their soul. They too have a religious zeal, a religious bigotry, whose hypocrisy is no less in pursuing their supposed rights to be shielded from all things that might upset their sentiments. This has nothing to do with religious or moral statements. This is an issue of frenetic souls who can’t bear to face what is real and true in their lives, and so distract themselves with inconsequentials, finding only more frenzy in the process. Unfortunately, such souls tend to feel the most power when making their confusion spread as wide as possible. Again, I’d be happy to see the Ten Commandments in every Church, and every home that would honor the first of Ten. Putting a monument in front of Courts and other public places is nothing but folks trying to find their salvation through causes rather than Christ, letting their distractions become their Spirit, and in so doing express to the world a wan Christianity which has little connection with the man on the Cross. The whole issue is a bother, with neither side in the right, and neither side showing anything more than juvenile expressions of supposed power. And will go to many lengths to get a hold of it, including a fair bit of acrobatics. 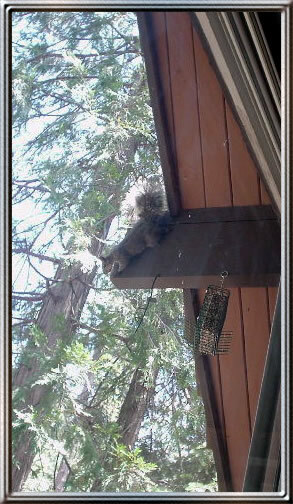 Holding on by one foot, this one tries to have a go at a now empty woodpecker feeder. In two days this thing was finished off by such squirrels. Makes for a good show while doing other things. 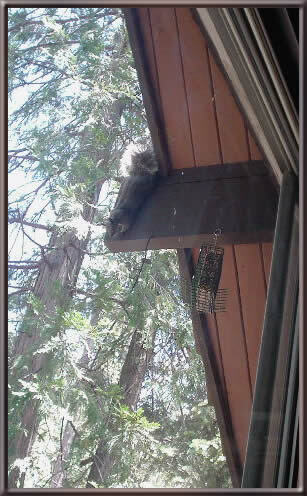 I’m not quite sure this beats the flicker, who stood sideways on this same beam with a toe stuck in a crack as support. Uncategorized Comments Off on I love America! Sure a good many of us are greedy capitalists striving for yet one more coin in our bank. But, when it comes down to it, when things start looking messy and problematic, we love our poetic justice. The developer is right. Tourists would come and spend money on local shops, likely more money than Justice Souter. Everyone would benefit except for the said jurist, who likely would find a better place. But, together as a society we could follow them, wherever they go. It’s beautiful because it’s not a breakdown of the separation of powers. It’s a reaction from good people against apparent tyranny. This is the genius of America at work, self correcting even if the normal channels are not working. No word if they will be throwing the tea out of his house before they bulldoze it. In my glance about the news of the day I happened to catch the tv listings. These intrigued me because tonight they basically show the whole problem of one network and the creativity of another. After Caesar’s assassination, the gladiator Tyrannus spirits the dead ruler’s nephew and heir away from the turbulence of Rome; Mark Antony addresses the crowds at the funeral, as a vestal virgin risks her life to guard Caesar’s will. On NBC is “I want to be a Hilton”, in which the Hilton mom picks a “lucky” person to discover the glories of the heiress lifestyle. “You too can use no end of money to make yourself even more vacuous and vapid!” (my interpretation of the show, and the head of NBC). If I watch a bit of television tonight, methinks ABC has done a good job by selling through interesting programming, so to there I will go. During a commercial break I might just go ahead and add NBC to the list of channel erased shopping networks and spanish stations. I went to bed at 10:00. I woke up wide awake at 11:15. Or, I should note, I fell asleep on the couch, and then went to bed, only as I lay there on my bed I was filled with no end of discontent. Discontent about everything. I couldn’t sleep, even a bit of reading didn’t halt the vague gnawing. So, I’m up still. The vague gnawing has dissipated, for the most part, yet I’m quite awake, and it’s now nearing two in the morning. I note this, again, in case there are reasons I don’t know the details… but apparently know about. Insight is always welcomed. Insomnia generally has a cause when it happens to me, though I don’t always know the cause. Especially the sort I have tonight. The Supreme Court said today that posting the Ten Commandments are not allowed in a courthouse. I think having such is religious posturing more than spirtual proclamation. Using such important things as a symbol is a waste of their meaning. The Ten Commandments are not meant to be moral suggestions and used as a nice reminder of God. They are the core foundations of the greater law, a law which cannot be separated from the other aspects of the Good News. Personally, I would much rather have every Christian and Jewish home have the Ten Commandments somewhere displayed. I’ve been in a lot of Christian homes in my life and never have seen a one. Nor have I ever seen the Ten Commandments posted in any Church. Not in our homes nor our churches, yet in the courts? Give me a break. Let’s start in our own houses, and maybe, just maybe, others might see the worth of such a list through example, for they never will through emaciated symbolism of some mythic golden era of Christendom. Just had another jolt there, a little bump of the earth, a little shuffle of the plate beneath. It’s not that much to note, except for the spate of such these last several weeks. Otherwise, for those who are noting such things, it is a overwhelmingly peaceful and still day up here in these mountains, the fair breeze contributing to the stillness, its real source something powerful and indecipherable.